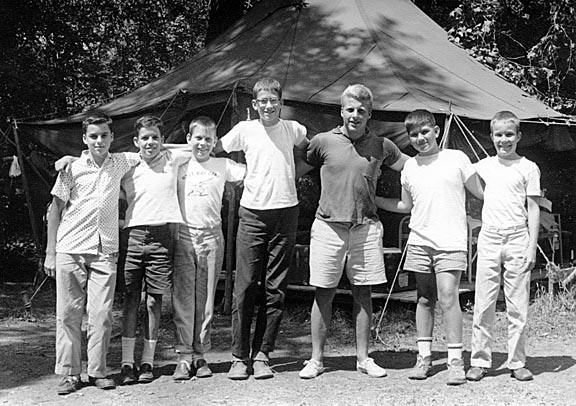 Nick King writing 06/07/12 - The tent 1 photo from 1960 is - L to R - : Alex Fisher, Phil Miller?, Carl Hendricks (baseball, 2nd base) Bert Shepard, John Singley, Mike Friedenthal and then me. Mac Mellor Writing - October 13, 2009 - [According to the 1960 tent list]...However, per my much earlier study of that photo and the tent list, I still see Alex Fisher on our left, the councilor is John Singley (not Rusty Staub), and the camper on our far right is I think Nick King. Mac Mellor Writing - September 9, 2009 - [According to the 1960 Tent List] Group 1 = Tent 1, 1960. Mac Mellor writing -- Alex Fisher at our left, councilor Rusty Staub? Left to right: Alex Fisher, Phil Miller, Carl Hendricks, Bert Shepard, John Singley, Mike Friedenthal, Nick King.